Happy New Year everyone! I’m kicking off 2017 by first taking a look back at the top projects of the past year. 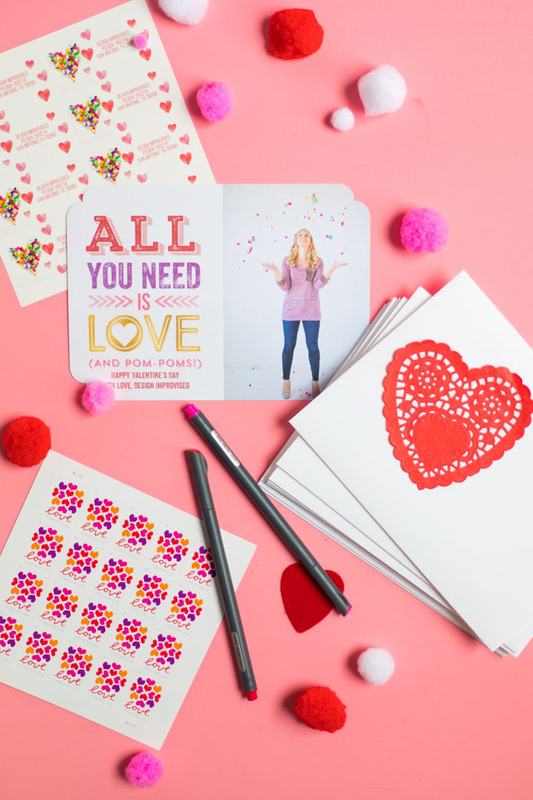 These were the posts that you all viewed and pinned the most – so thank you! It is always a bit of a surprise to see what makes the Top 10. This year’s lineup includes a couple personal faves like my sand art terrariums and cardboard wall art. 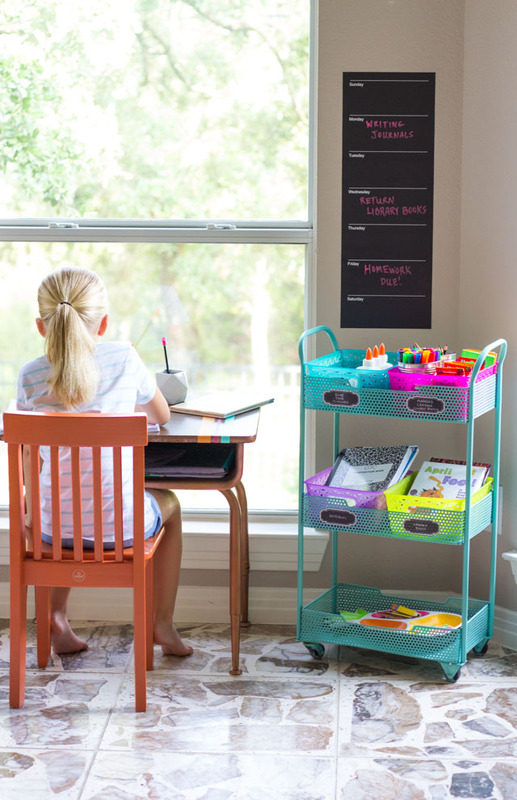 Of course, I always love to see a balloon project make the list, and our homework station has been one my most useful projects in our home. The project that made the top of the list couldn’t be more perfect for this time of year. 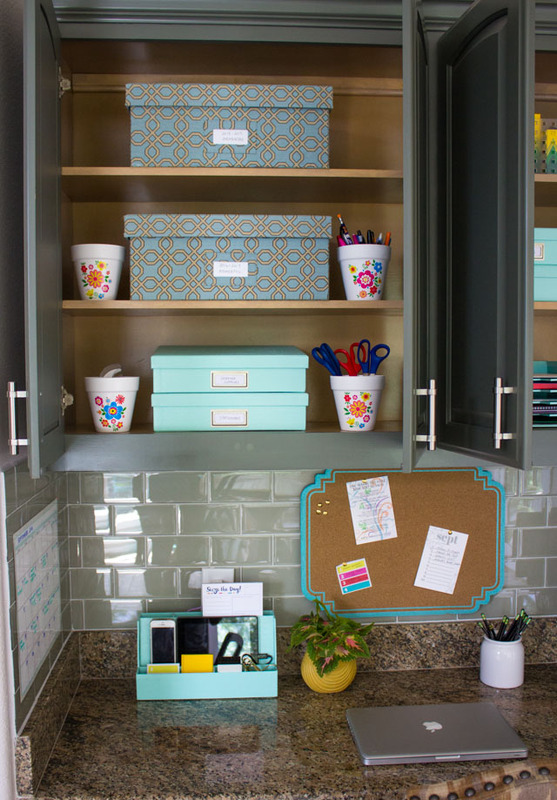 It turns out you guys love organizing most of all! 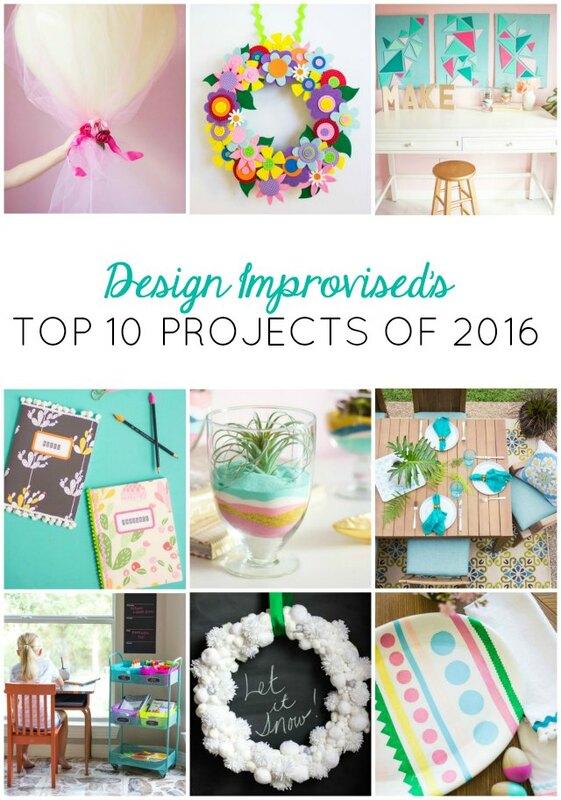 Check out my countdown from 10 to 1 to see the top project of 2016! 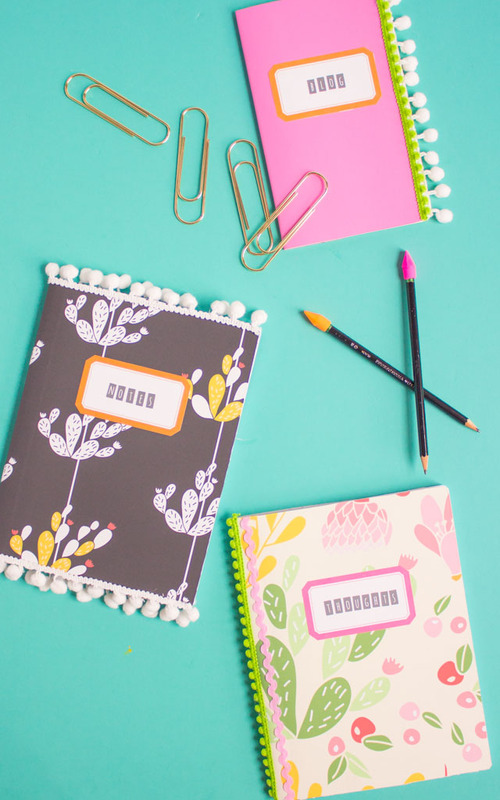 Part of my back-to-school series, I used pom-pom trim and adhesive vinyl to cover inexpensive composition notebooks. One of my many projects for Oriental Trading this past year, and one of my most colorful ones as well! 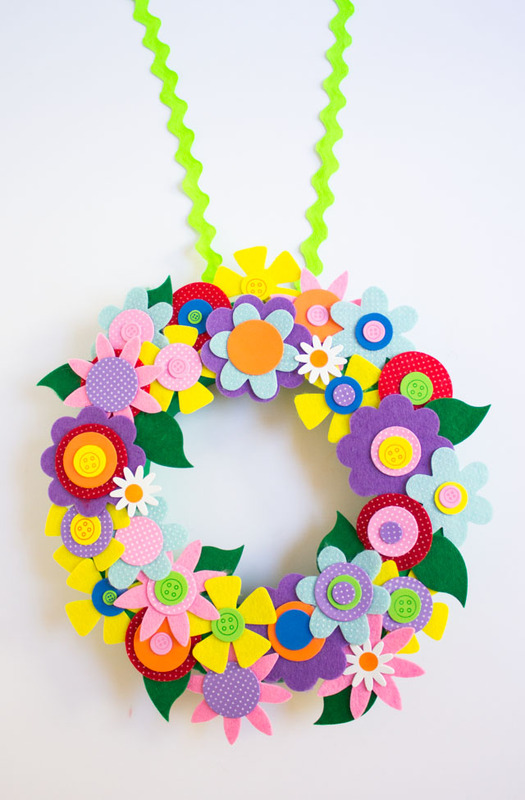 I used their simple pre-cut felt flower craft kit to make this pretty spring wreath. 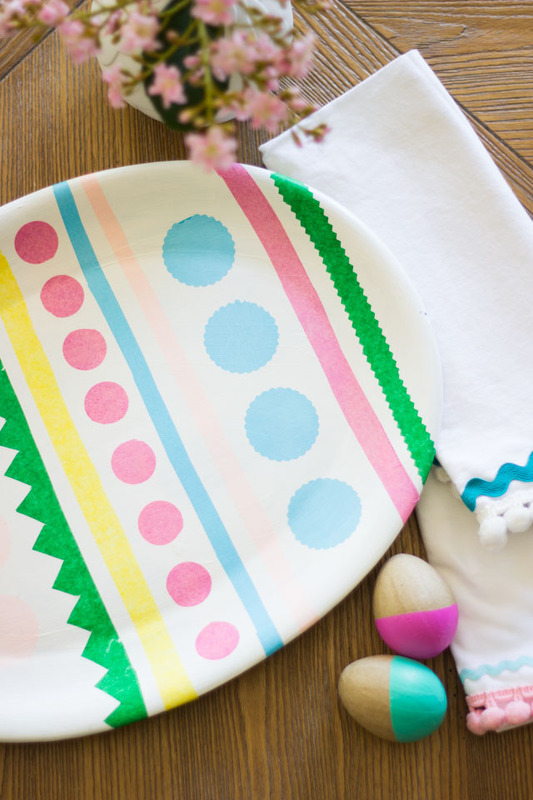 I love a good thrift store makeover, and this Easter egg tray started out as fruit covered platter from the Goodwill. Click through for the dramatic before and after! This was such a fun crafting challenge. The moving company Two Men and a Truck asked me to create anything I wanted out of cardboard. 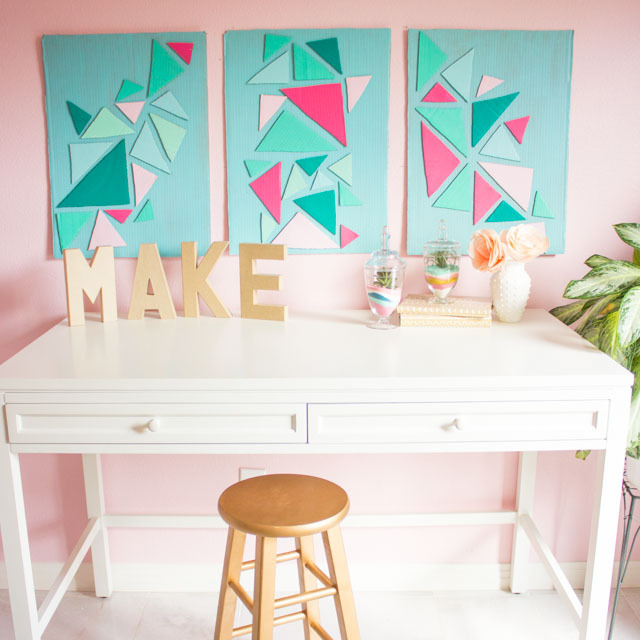 I came up with this colorful wall art for my office by using one of their moving boxes! 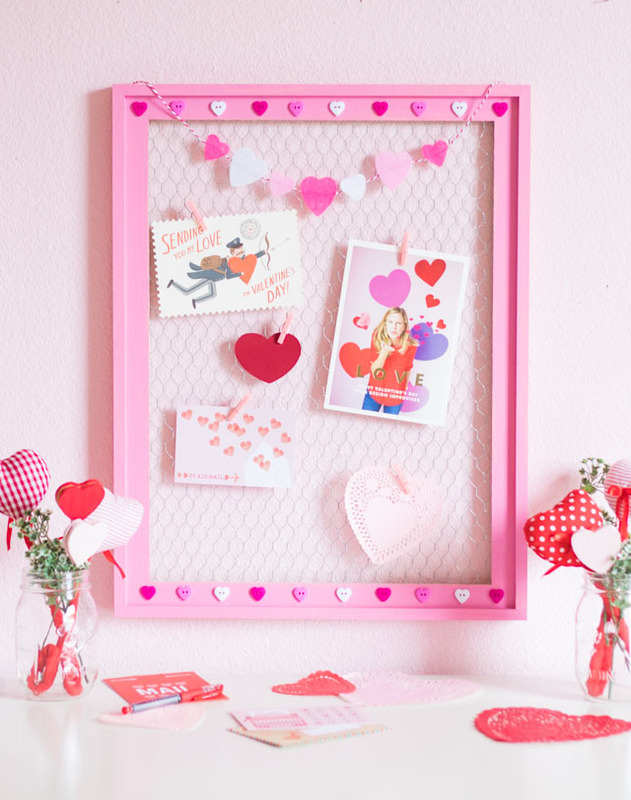 I always love when you all appreciate yet another pom-pom craft I come up with! 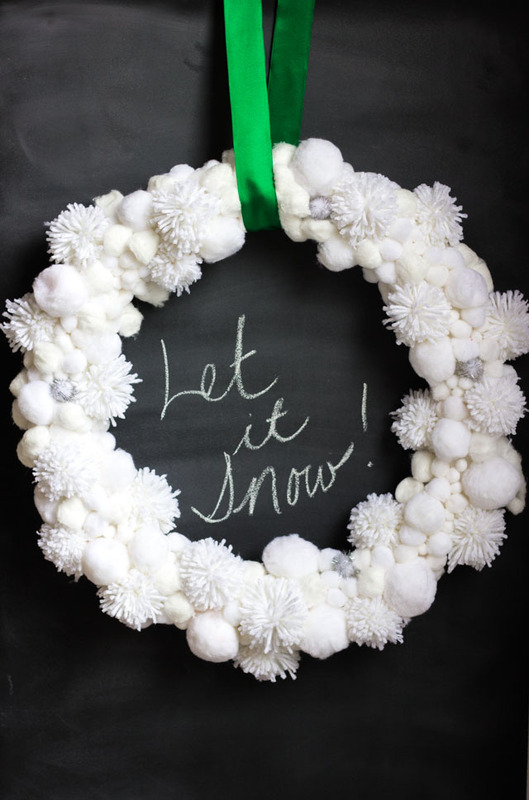 I made this snowball wreath with a mix of pom-poms, yarn pom-poms, and even cotton balls for my winter woodland mantel. While I love making pretty things, this project I did for At Home has been a workhorse in our home this year. Each day after school Stella sits in this little desk and works on her homework. 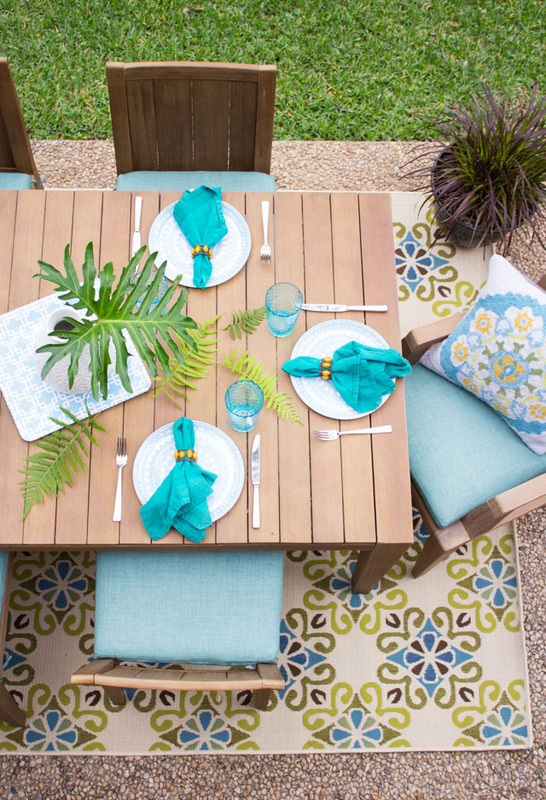 Our patio got a spring makeover thanks to a gorgeous outdoor dining table and colorful decor from Home Decorators Collection. 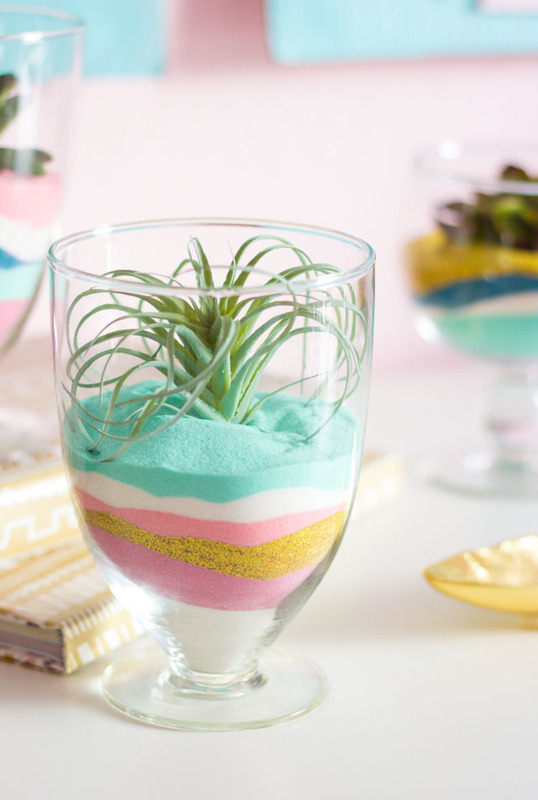 I’ve filled this set of glass jars with all sorts of things this past year, but these pretty sand art succulents are my favorite! 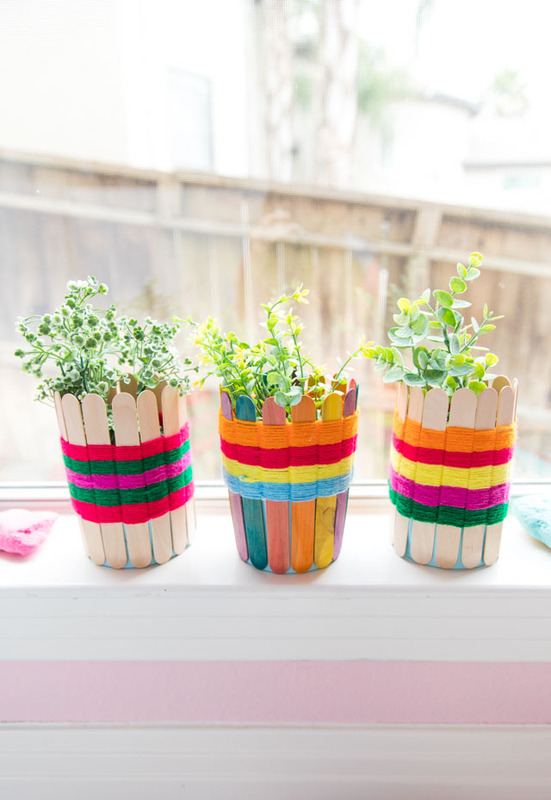 The best part is – no watering required. The succulents aren’t real! Yay! 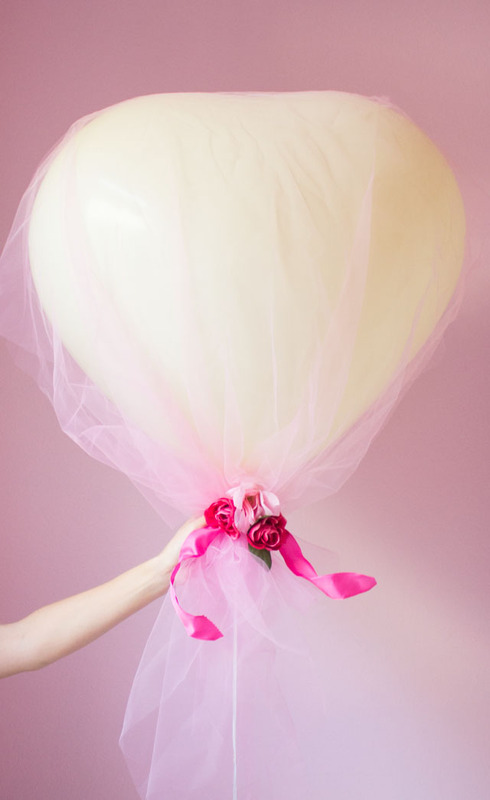 A balloon project made it to the top of the list! If you are new to Design Improvised, don’t miss these other fun balloon crafts I’ve made over the years. Thanks so much to each of you for following along with Design Improvised last year! 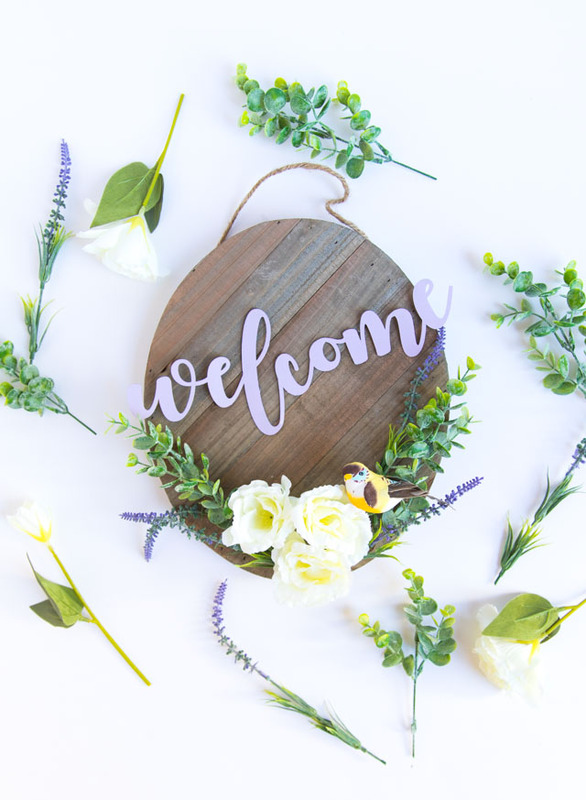 I hope to continue to bring you fresh, fun, and colorful crafts and decorating ideas in 2017. It’s going to be a good year!